We have already mentioned various kingdoms of the barbarian tribes who set up a more or less flimsy dominion over this or that area amidst the debris of the empire, the kingdoms of the Suevi and West Goths in Spain, the East-Gothic kingdom in Italy, and the Italian Lombard kingdom which succeeded the Goths after Justinian had expelled the latter and after the great pestilence had devastated Italy. The Frankish kingdom was another such barbarian power which arose first in what is now Belgium, and which spread southward to the Loire, but it developed far more strength and solidarity than any of the others. It was the first real state to emerge from the universal wreckage. It became at last a wide and vigorous political reality, and from it are derived two great powers of moderm Europe, France and the German Empire. Its founder was Clovis (481-511) who began as a small king in Belgium and ended with his southern frontiers nearly at the Pyrenees He divided his kingdom among his four sons, but the Franks retained a tradition of unity in spite of this division, and for a time fraternal wars for a single control united rather than divided them. A more serious split arose, however, through the Latinization of the Western Franks, who occupied Romanized Gaul and who learnt to speak the corrupt Latin of the subject population, while the Franks of the Rhineland retained their Low German speech. At a low level of civilization, differences in language cause very powerful political strains. 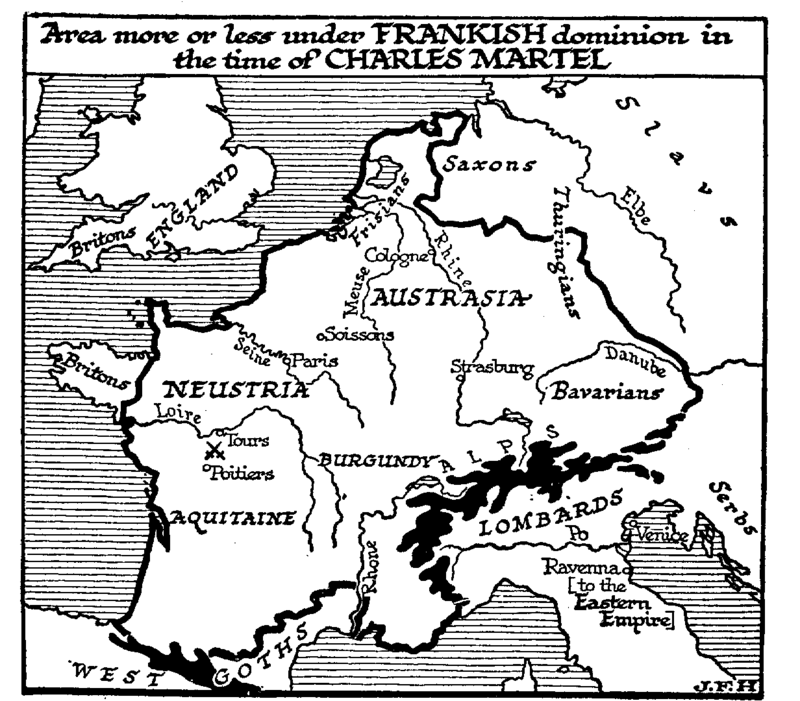 For a hundred and fifty years the Frankish world was split in two, Neustria, the nucleus of France, speaking a Latinish speech, which became at last the French language we know, and Austrasia, the Rhineland, which remained German. We will not tell here of the decay of the dynasty, the Merovingian dynasty, founded by Clovis; nor how in Austrasia a certain court official, the Mayor of the Palace, gradually became the king de facto and used the real king as a puppet. The position of Mayor of the Palace also became hereditary in the seventh century, and in 687 a certain Pepin of Heristhal, the Austrasian Mayor of the Palace, had conquered Neustria and reunited all the Franks. He was followed in 114 by his son, Charles Martel, who also bore no higher title than Mayor of the Palace. (His poor little Merovingian kings do not matter in the slightest degree to us here.) It was this Charles Martel who stopped the Moslems. They had pushed as far as Tours when he met them, and in a great battle between that place and Poitiers (732) utterly defeated them and. broke their spirit. Thereafter the Pyrenees remained their utmost boundary; they came no further into Western Europe. Charles Martel divided his power between two sons, but one resigned and went into a monastery, leaving his brother Pepin sole ruler. This Pepin it was who finally extinguished the descendants of Clovis. He sent to the Pope to ask who was the true king of the Franks, the man who held the power or the man who wore the crown; and the Pope, who was in need of a supporter, decided in favour of the Mayor of the Palace. So Pepin was chosen king at a gathering of the Frankish nobles in the Merovingian capital Soissons, and anointed and crowned. That was in 751. The Franco-Germany he united was consolidated by his son Charlemagne. It held together until the death of his grandson Louis (840), and then France and Germany broke away again-to, the great injury of mankind. It was not a difference of race or temperament, it was a difference of language and tradition that split these Frankish peoples asunder. That old separation of Neustria, and Austrasia still works out in bitter consequences. In 1916 the ancient conflict of Neustria. and Austrasia had broken out into war once more. In the August of that year the present writer visited Soissons, and crossed the temporary wooden bridge that had been built by the English after the Battle of the Aisne from the main part of the town to the suburb of St. Médard. Canvas screens protected passengers upon the bridge from the observation of the German sharpshooters who were sniping from their trenches down the curve of the river. He went with his guides across a field and along by the wall of an orchard in which a German shell exploded as he passed. So he reached the battered buildings that stand upon the site of the ancient abbey of St. Médard, in which the last Merovingian was deposed and Pepin the Short was crowned in his stead. Beneath these ancient buildings there were great crypts, very useful as dug-outs-for the German advanced lines were not more than a couple of hundred yards away. The sturdy French soldier lads were cooking and resting in these shelters, and lying down to sleep among the stone coffins that had held the bones of their Merovingian kings. The Franks differed from the Swabians and South Germans, and came much nearer the Anglo-Saxons in that they spoke a “Low German” and not a “High German” dialect. Their language resembled plattdeutsch and Anglo-Saxon, and was the direct parent of Dutch and Flemish. In fact, the Franks where they were not Latinized became Flemings and “Dutchmen” of South Holland (North Holland is still Friesisch-i.e. Anglo-Saxon). The “French” which the Latinized Franks and Burgundians spoke in the seventh to the tenth centuries was remarkably like the Romansch language of Switzerland, judging from the vestiges that remain in old documents. —H. H. J.